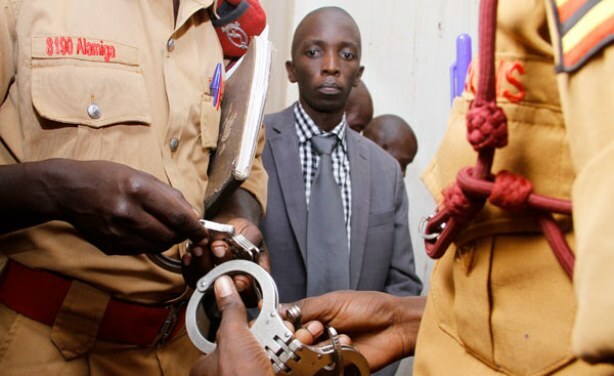 KAMPALA – Brian Bagyenda; a son to ISO director Col. Frank Bagyenda Kaka has asked the High court to allow him plead guilty to charges of murdering his girlfriend Enid Twijukye in exchange of a lighter sentence. Bagyenda made the plea-bargain application on Thursday through his lawyer Mr. Nsubuga Mubiru as he appeared before Justice Anthony Ojok Ayu who is presiding over a session of 40 capital offenders. Bagyenda, a pharmacist, appeared together with two alleged accomplices Innocent Bainomugisha (24), a cleaner and Vincent Rwahwire(28), a casual labourer. The prosecution states that on January 4, 2017, at Njobe Road in Nakawa Division, Kampala district, Bagyenda with his two accomplices, with malice aforethought, murdered his girlfriend Twijukye. According to the prosecution: “Bagyenda confessed to killing the deceased (Twijukye). Justice Ayu adjourned the case to December 17 for both the prosecution and defence to inform court the outcome of their discussions on the gravity of the sentence.